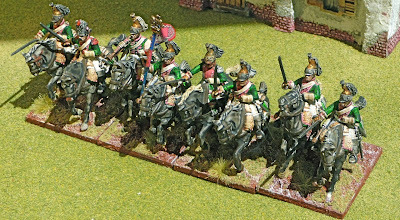 In between painting my Austrian units and to break things up I have been painting various units to fill in the holes of my other armies. I need 4 regiments of French Dragoons for the Lasalle Reserve Dragoon Brigade. 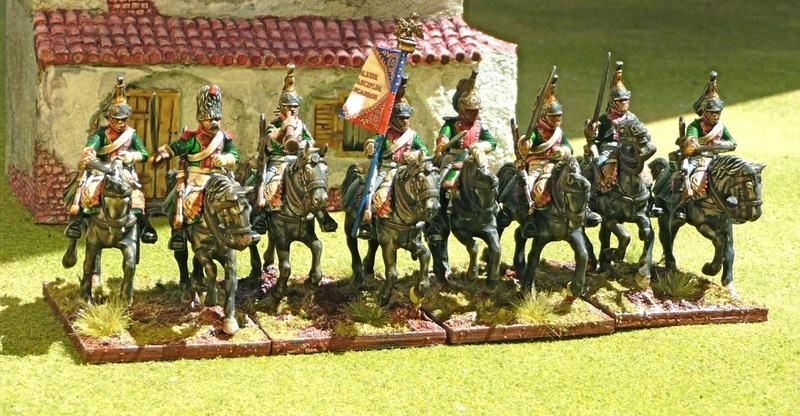 Here is the first regiment, the 15e régiment dragoons. I picked them as they have pink facings, who could resist the combination of pink and green. I am trying to stick with historical OB's, and am using Montbrun's cavalry reserve at the battle of Fuentes de Oñoro in 1811 as the basis for my choices. 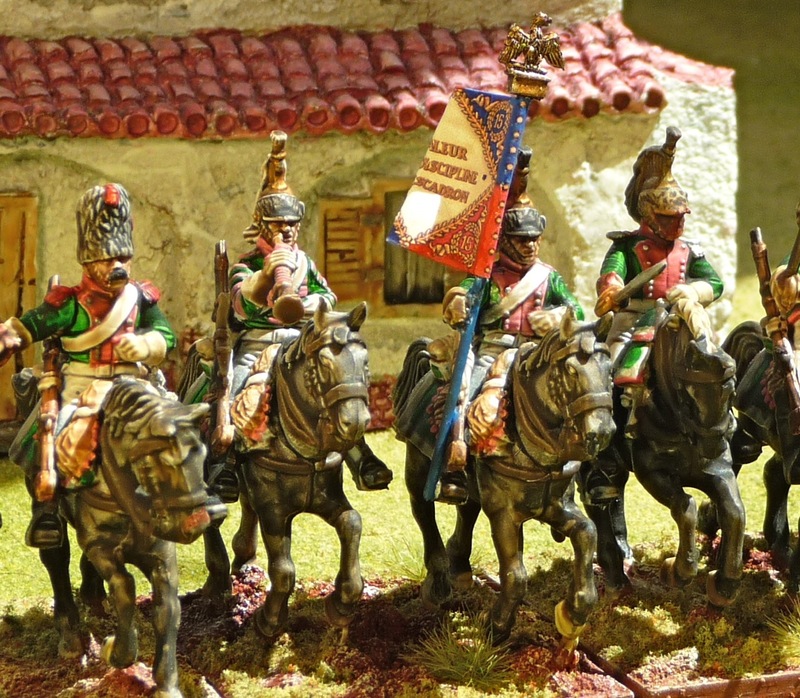 I have already painted the 6e régiment (Front Rank) with their scarlet facings. I plan to paint the 25e (orange facings) and the 11e (crimson facings). I am still undecided about the last unit, as there were no yellow faced units in the division, but I may be still tempted. These are Perry plastics and of course are the later uniforms (post 1812), but that really does not bother me that much. These are nice figures and because of their relative cost I will continue to use them for all 3 units in this brigade. They are not as nice as the Front Rank, the models are less defined and I overdid it with the primer on a couple of the figures. They are pretty nice, however, and are a welcome addition to my French forces. The standard bearer is not the correct figure from the package, but one made up from 1 of the troopers. The box, I bought, was missing the command sprue. Subsequently, a very kind wargamer from Kentucky sent me the missing sprue, thus the commander is correct. You really are an Artiste, sir! Those look excellent John. The group shot has a real feeling of movement. I like the muted colours that you use on your figures. 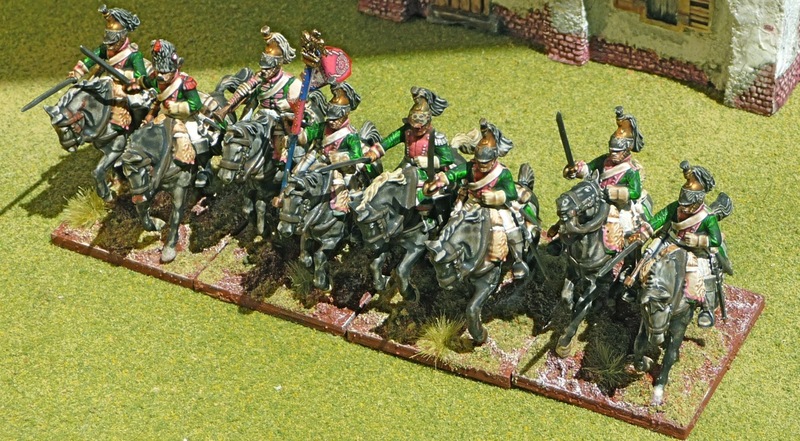 Can I ask how the horses compare to Front Rank horses for size? Nicely done. 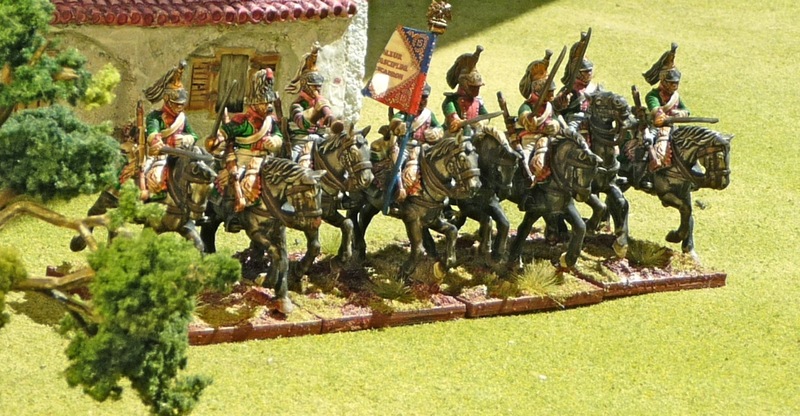 I've picked up a box of Perry Dragoons myself and yours are the first I've seen painted. 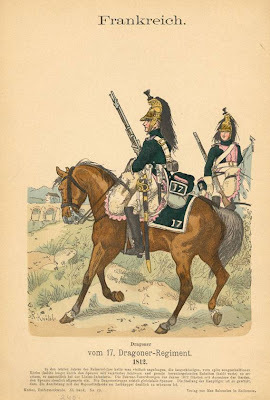 I'm considering which regimental colours to use at present (they'll be accompanying my 30th de ligne infantry - so you're looking at the period of 1810-11). Thank you gentleman, they are nice figures. Lee, see my latest post.